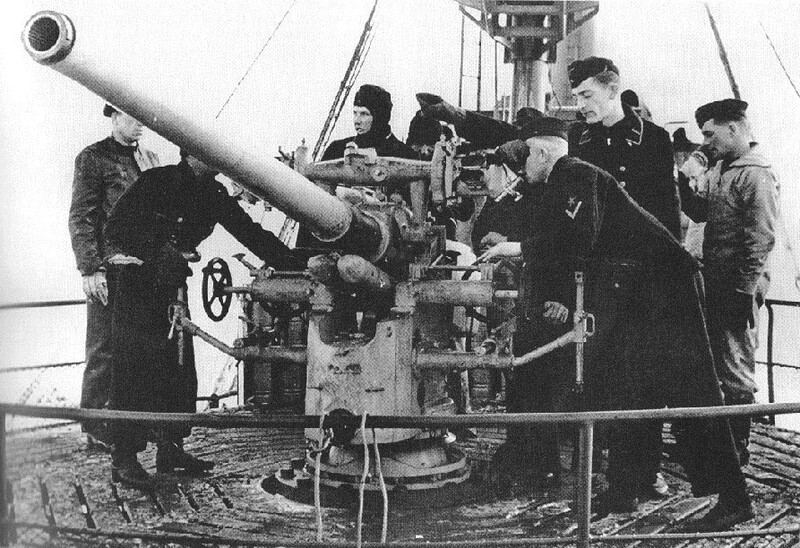 Gunnery drill for a 8.8 cm/45 SK C/30 gun in Flak L C/30 pedestal mount on bows of "KFK" class auxiliary ship. Brackets for mounting a shield are visible, but the shield itself is missing. CAW Collection Photograph. 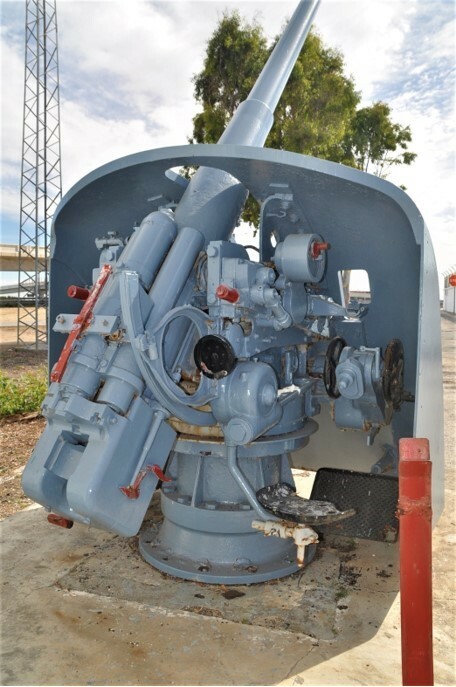 These guns were intended for smaller warships such as submarine-chasers and Flak corvettes. The KM41 was a lighter version but is not believed to have actually entered service. Both of these guns were significantly lighter than the older 8.8 cm (3.46") SK L/45 guns. The SK C/30 had a barrel and breech ring with a loose liner and a half-length jacket. A vertical sliding breech block was used. The liner was attached to the breech ring with a brass nut and to the jacket with a ring with an asbestos seal to keep out water and other debris. The KM41 used a monobloc barrel with a muzzle brake and used a horizontal sliding breech block. The gun barrel could easily be removed from the breech end-piece. 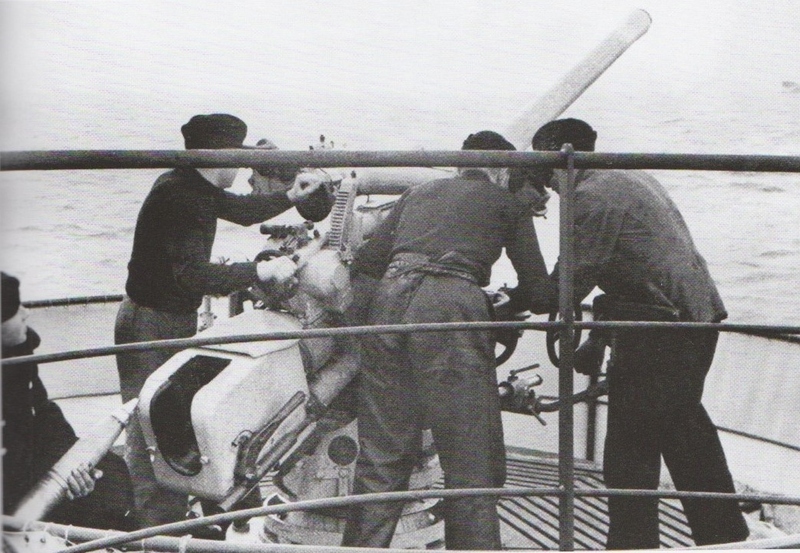 A number of these naval guns were sold to the Nationalists during the Spanish Civil War where they were used both on ships and as mobile land artillery as can be seen in the photographs below. These guns remained in service until the 1950s. 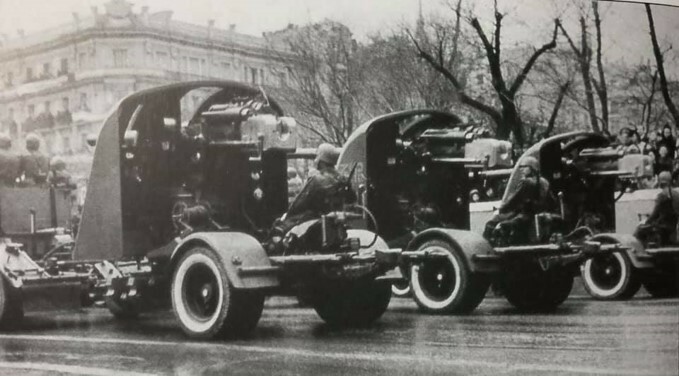 Many of the older, World War I-era, 8.8 cm SK L/45 weapons were modified during the 1930s and 1940s to use the same ammunition as the SK C/30 and these guns then had similar performance. 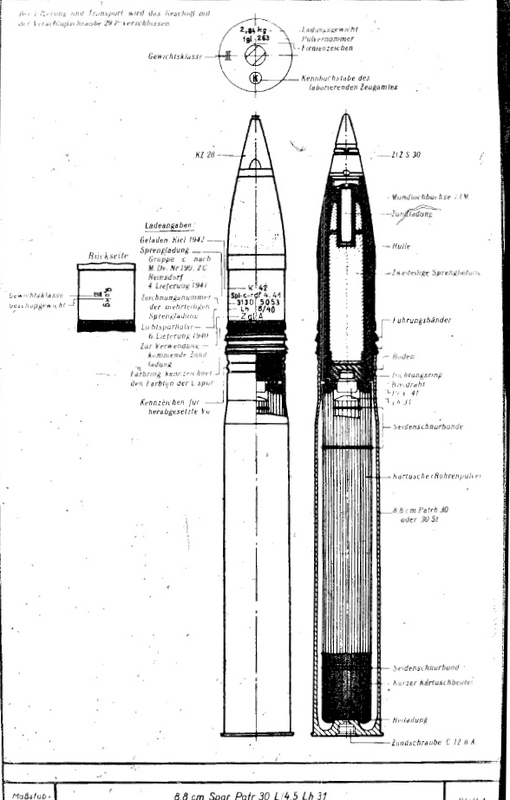 Guns so modified added (n R) [nachgebohrte Rorhe - "improved drilled barrel"] at the end of their designations, such as 8.8 cm SK L/45 (n R). Unless otherwise noted, the data below is for the 8.8 cm/45 (3.46") SK C/30. ^There were many different kinds of ammunition for these weapons. The ones listed above are meant to be representative, but by no means is this a complete listing. ^1.11.21.3The SKC/30U, Ubts L C/35 and Ubts Flak LC/41 were wet-mounts for U-boats. 8.8 cm/45 SK C/30 gun in Flak L C/30 pedestal mount on bows of "KFK" class auxiliary ship. Photograph from CAW collection. 8.8 cm HE round. Sketch from M.Dv. Nr. 170,16. Last of the Spanish 8.8 cm SK C/30 guns now a war memorial. Photograph copyrighted by Javier Villarroya and used here by his kind permission. 8.8 cm SK C/30 guns used as mobile artillery during the Spanish Civil War. Photograph courtesy of Javier Villarroya.